I was fortunate enough to have the opportunity recently to attend the Drunken Zombie Film Festival in Peoria, IL. There was an intimacy to the event that made it feel special and both the attendees and organizers were friendly and obviously passionate about the genre. As an indie horror fan, I was thrilled that I was going to be able to see the latest offerings on the big screen from a few up and coming indie horror directors that I have been following for quite some time, including Cameron McCasland's 80's retro slasher The Lashman and Corey Norman's adaptation of the Stephen King short story Suffer the Little Children. Both of these films were great and myself and the audience had a blast viewing them. However, it was a Christmas themed slasher film featuring a killer in a Santa suit by a director I was unfamiliar with that really piqued my interest while attending the festival. Those who know me know that my all time favorite horror film is 1974's Black Christmas. There is just something about the juxtaposition of what is proclaimed as the most joyous time of the year with bloodshed and suspense that I find intriguing. Suffice to say, I am also a fan of other Christmas themed slashers such as To All a Good Night, Don't Open Til Christmas, Silent Night Deadly Night and more recently my pal and Party Night Co-Producer Kevin Sommerfield's Dismembering Christmas. My major curiosity going into All Through the House with very little knowledge of the plot was how could it possibly be different from the films mentioned above? Thanks so much for taking the time to do an interview with us. For those who may be unfamiliar with you and your work, can you tell us a little bit about yourself? I became obsessed with horror movies in middle school. To me, movies were magical because they could terrify an audience and evoke that kind of strong emotion. I remember writing my first slasher story in elementary school. In high school, I adapted Friday The 13th as a stage play and the process forced me to dig deeper into the story and characters so that I could adapt the film without losing its essence. The play was a huge success - even though the school administration hated it. But, three months later I was able to produce a successful sequel. By the time I graduated high school, I was writing original content for the stage, so screenwriting and directing movies was the next logical step. I have tons of homemade horror movies on VHS. What films/directors inspired you to make horror films? Well, of course, I love John Carpenter, Wes Craven, Quentin Tarantino, and Ridley Scott. But, I'm very, influenced by all the amazing independent directors out there making a name for themselves: The Soska Sisters, Ti West, and Jessica Cameron. I am a big fan of independent movies, especially horror movies, because I know what it takes to accomplish such a feat without a studio budget. The amount of determination and dedication that is needed is beyond what the average person can comprehend. Your love of the slasher genre in particular shines through with All Through the House. What are some of your favorite slasher films and what films directly inspired you to make this particular film? The first Horror movie I saw was Halloween and I have to say, it changed my life. I had never felt anything like that in my entire sweet childhood life. I was in the fourth grade and my whole family watched it on HBO. My mom instantly regretted letting me watch Halloween and insisted that I never see another horror movie again, but I couldn’t get it out of my mind. When I heard about Friday The 13th I was determined to see it and sneak-watched it one night on TV. I couldn't sleep for weeks afterwards. I loved it. Eventually, my mother caved in and became my number one horror movie-watching buddy. I loved Hell Night, Black Christmas, Night Warning, The House on Sorority Row, The Fog, and The Prowler. 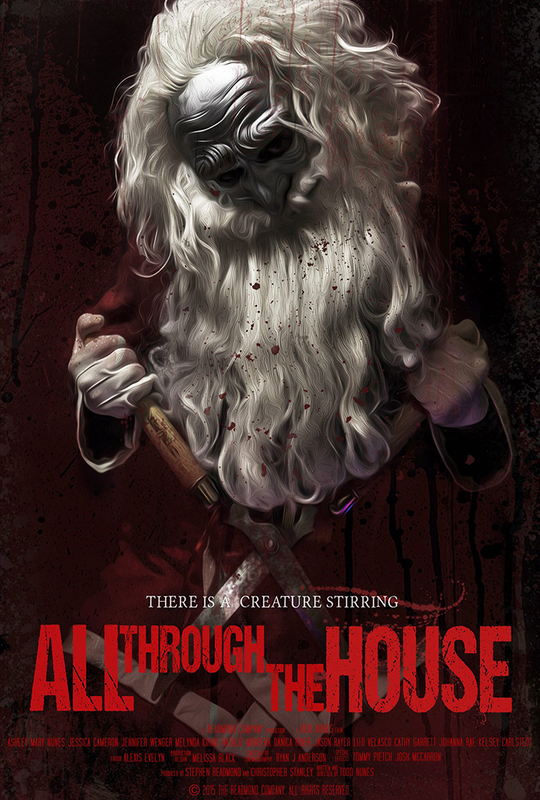 All Through The House is a mash-up of Halloween/Friday the 13th and a dash of Silent Night, Deadly Night. One of the most controversial slasher films of all time, Silent Night Deadly Night, received much of its criticism because it took place on Christmas and had a killer in a Santa suit, So, why a Christmas themed slasher? This film has been burning inside me since I first saw the poster for Silent Night, Deadly Night featuring an evil Santa slinking down a chimney with an axe. I was fascinated by that poster. My mind went wild. My mother refused to let me see the film because I was too young, but I was mesmerized by that image. Years passed before I saw that movie and I have to admit, I was a bit disappointed. I can appreciate it as a classic 80s slasher now, but the initial story in my mind was much darker, scarier, and violent. I always felt there was a dark side to Christmas. Movies like A Christmas Carol and The Grinch had very dark subject matter that influenced me. I was also intrigued by the controversy that surrounded SNDN and I wanted All Through The House would continue that tradition. Your masked Santa psychopath is a paramount example of a classic slasher film killer. How was his character developed and what were you attempting to bring to the genre with the character? Also, where did the creepy, awesome design for the mask come from? I spent a lot of time developing the character's mythology. In fact, that's where I started when developing the story. I really wanted the story to emerge from this character. I wanted to create a slasher killer that I hadn't seen before. It was really important to me that he be a horribly evil character who also had some sympathetic qualities. I find that combination to be the most interesting and disturbing. There is much more to the killer's story that I hope to explore someday. The mask was imperative to the killer, so it had to be just right. We had a photo shoot with actor Lito Velasco where he wore a dozen different masks. After some adjustments, like wigs, beards, and painting it silver, we all knew it was the ONE. Your sister, Ashley Mary Nunes, plays the lead character Rachel in the film. What was it like directing her? Any brother-sister disagreements while filming? Jessica Cameron calls us the “brother/sister horror duo”, and Ashley and I work really well together. When we were little Ashley used to beg me to scare her, and she’s been acting in my horror films since she was five years old. She has absolutely no limitations. If I ask Ashley to jump off a roof. She will. If I ask her to get in a bathtub of blood and gore... She will. And it’s not just because she’s my baby sister, she won't even blink about the request, and that’s ideal for a horror director. Ashley truly loves the genre and she’s willing to do whatever it takes to get the shot. From a directorial standpoint, what was the most difficult obstacle you encountered while filming All Through the House? Any interesting stories from the set? Obviously working with a small budget is difficult, but not impossible. It really comes down to planning out every detail and thinking creatively. I didn't want to skimp on Christmas set decoration, so I started hunting at garage sales, feel markets, and asking for donations. It was a lot of hard work, but it really paid off. I wanted every shot to look like Christmas threw-up all over it. The Holiday season really shines through. Another obstacle was that the entire movie takes place at night. All Through The House was shot during the summer when the days are longer, so that was a big challenge. The sun didn't go down completely until 9:30 pm and showed signs of rising at about 4 am. Many times we were racing to beat the sun. I don't mind remakes. For me, a remake never takes the place of the original. John Carpenter's Halloween will always be the king of slasher movies and no remake will ever take that away. The best remakes maintain a great balance of staying true to the source, as well as, adding new material to make the story feel fresh. Remakes like The Texas Chainsaw Massacre, Last House On The Left, and When A Stranger Calls are some of the best. There are also a lot of duds like the remakes of A Nightmare On Elm Street and Prom Night. If I had a choice, I would love to do a remake of a lesser know slasher movie called Humongous. I think that movie has a really fun premise that can be expended upon. Speaking of remakes… That is exactly what I am currently working on. I can't divulge the title just yet, but I can say that I loved the original and I'm honored to be doing the remake. I prefer to say "reimagining". My intention is not to try and make the original a better film, because I already think it's pretty good the way it is. My goal is to take the concept and create a movie that explores the subject matter in a different way… much like the remake of The Texas Chainsaw Massacre. I'm really excited about the project and I can't wait to officially announce it.